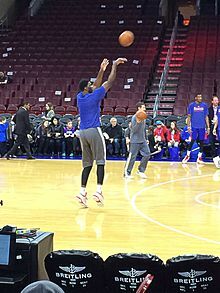 Joel Hans Embiid (/dʒoʊˈɛl ɛmˈbiːd/ joh-EL em-BEED; born 16 March 1994) is a Cameroonian professional basketball player for the Philadelphia 76ers of the National Basketball Association (NBA). After one year of college basketball with the Kansas Jayhawks, he was drafted with the third overall pick in the 2014 NBA draft by the 76ers. Multiple foot and knee injuries delayed his debut for two seasons until 2016–17, when he was named to the NBA All-Rookie First Team despite playing only 31 games. Embiid has received two All-Star selections. He has nicknamed himself "The Process" in response to a refrain from 76ers fans during the Sam Hinkie era to "trust the process". On 24 October 2018, Embiid had 30 points and 19 rebounds in a 123–108 loss to the Milwaukee Bucks, becoming the franchise's first player to reach those marks in the same game since Charles Barkley did so in November 1991. 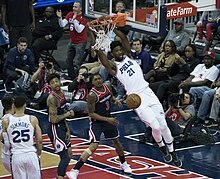 On 27 October, he had 27 points and 14 rebounds in a 105–103 win over the Charlotte Hornets, thus registering a double-double in all six games to start the season. He became one of seven players with 2,000 points, 1,000 rebounds and 200 blocks in his first 100 games, joining Tim Duncan, Shaquille O'Neal, Alonzo Mourning, David Robinson, Hakeem Olajuwon and Ralph Sampson. On 1 November, he had 41 points and 13 rebounds in a 122–113 win over the Los Angeles Clippers. Two days later, he recorded 39 points and 17 rebounds in a 109–99 win over the Detroit Pistons. Thirty-two of his 39 points came in the first half, the highest for a Sixer since Allen Iverson had 33 points in the first half on 18 December 2004 against the Milwaukee Bucks. On 9 November, he recorded 42 points and 18 rebounds in a 133–132 overtime win over the Hornets. On 14 November, he recorded his first career triple-double with 19 points, 13 rebounds and 10 assists in a 111–106 loss to the Orlando Magic. On 14 December, he recorded 40 points and 21 rebounds in a 113–101 loss to the Indiana Pacers, becoming the first Sixers player with at least 30 points and 20 rebounds in a game since Barkley on 7 December 1990. On 2 January, he matched his season high with 42 points, including 30 in the first half, and grabbed 18 rebounds in a 132–127 win over the Phoenix Suns. On 10 March, he returned from an eight-game absence with a sore left knee and recorded 33 points and 12 rebounds in a 106–89 win over the Pacers. On 17 March, he had 40 points and 15 rebounds in a 130–125 win over the Bucks. On 20 March, Embiid scored 37 points and had a career-high 22 rebounds in a 118–115 win over the Boston Celtics. On 28 March, he had 39 points, 13 rebounds and six assists in a 123–110 win over the Brooklyn Nets. On 4 April, he returned from a three-game absence and had 34 points, 13 rebounds, 13 assists and three blocks in a 128–122 loss to the Bucks. He joined Wilt Chamberlain as the only other big man in team history with multiple triple-doubles in the same season. Embiid finished the season missing 14 games after the All-Star break, including five of the final seven games, due to rest and injury. ^ "76ers Media Guide 2017–18, page 98 (roster)" (PDF). NBA.com. Retrieved 24 September 2018. ^ "2016–17 NBA Pronunciation Guide (Start of Season)" (PDF). NBA.com. Retrieved 24 September 2018. ^ Aldridge, David (21 November 2016). "A process toward success: Joel Embiid era begins (at last) in Philly". NBA.com. Retrieved 1 December 2016. He is actually introduced in the starting lineup as "Joel, The Process, Embiid." ^ Rappaport, Max (27 October 2016). "If Joel Embiid Is The Process, His Debut Proved We Should Trust Him". Complex. Retrieved 1 December 2016. ^ Jenkins, Lee (26 October 2016). "Joel Embiid: 'I'm The Process'". Sports Illustrated. Retrieved 1 December 2016. ^ a b c Shelburne, Ramona (12 December 2017). "How Joel Embiid is trolling the NBA". ESPN. Retrieved 12 December 2017. ^ "What does Trust the Process mean?". SI.com. Retrieved 1 February 2019. ^ a b c Con, Jordan (27 June 2014). "Started From Yaoundé, Now He's Here". Grantland. Retrieved 27 June 2014. ^ a b c d DeCourcy, Mike (23 January 2014). "Joel Embiid's pursuit of hoops greatness not just a Dream". The Sporting News. Retrieved 27 June 2014. 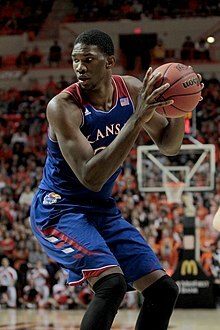 ^ "Report: Kansas basketball star Joel Embiid will enter NBA Draft". Retrieved 22 October 2016. ^ a b Telep, Dave (13 November 2012). "Kansas lands recruit Joel Embiid". ESPN. ESPN Internet Ventures. Retrieved 27 June 2014. ^ a b Jenkins, Lee (26 October 2016). "Joel Embiid: 'I'm The Process'". Sports Illustrated. Retrieved 27 October 2016. ^ "KU's Embiid grows as a basketball player". ^ "Rivals.com". Retrieved 22 October 2016. ^ "2013–14 Men's Naismith Trophy Midseason 30". Naismith Awards. 13 February 2014. Archived from the original on 22 February 2014. Retrieved 14 February 2014. ^ "Joel Embiid Stats". Sports-reference. Archived from the original on 6 October 2014. Retrieved 2 October 2014. ^ Goodman, Jeff (11 March 2014). "Joel Embiid out indefinitely". ESPN. ESPN Internet Ventures. Retrieved 1 October 2014. ^ Golliver, Ben (9 April 2014). "Kansas' Joel Embiid declares for 2014 NBA draft". Sports Illustrated. Retrieved 1 October 2014. ^ Amico, Sam (21 June 2014). "No. 1 question: How far will Joel Embiid fall?". Fox Sports Ohio. Retrieved 1 October 2014. ^ "Sixers draft Joel Embiid at No. 3". ESPN. ESPN Internet Ventures. 27 June 2014. Retrieved 1 October 2014. ^ "Joel Embiid Signs Rookie Deal With 76ers - RealGM Wiretap". Retrieved 22 October 2016. ^ "Sixers Sign Joel Embiid". Retrieved 22 October 2016. ^ "76ers Unsure If Joel Embiid Will Play At All This Season - RealGM Wiretap". Retrieved 22 October 2016. ^ "Statement from Sixers GM Sam Hinkie". NBA.com. Turner Sports Interactive, Inc. 13 June 2015. Retrieved 14 June 2015. ^ Doshi, Sohil (19 August 2015). "Report: Joel Undergoes Second Surgery". Retrieved 22 October 2016. ^ "76ers center Embiid to miss season following foot surgery". Retrieved 22 October 2016. ^ Harper, Zach (30 September 2016). "Joel Embiid will start his first career preseason game after two years inactive". CBSSports.com. Retrieved 22 October 2016. ^ Seltzer, Brian (4 October 2016). "Game Recap: Embiid, Saric Debuts Highlight 92-89 Win". NBA.com. Retrieved 22 October 2016. ^ "Westbrook, Thunder spoil Embiid's debut for 76ers". ESPN.com. 26 October 2016. Retrieved 27 October 2016. ^ "Magic rally from 18 down to top winless 76ers 103-101". ESPN.com. 1 November 2016. Retrieved 1 November 2016. ^ "Joel Embiid scores 25 to lead 76ers to first win of the season". ESPN.com. 11 November 2016. Retrieved 20 November 2016. ^ "Embiid scores career-high 26 as Sixers rout Suns 120-105". ESPN.com. 19 November 2016. Retrieved 20 November 2016. ^ "Joel Embiid Named Eastern Conference Rookie of The Month". NBA.com. 1 December 2016. Retrieved 6 December 2016. ^ "Embiid's career-high 33 points lift 76ers over Nets 108-107". ESPN.com. 18 December 2016. Retrieved 19 December 2016. ^ "Joel Embiid, Buddy Hield named Kia Rookies of the Month". NBA.com. 3 January 2017. Retrieved 4 January 2017. ^ "McConnell's jumper lifts Sixers past Knicks". Reuters. 11 January 2017. Retrieved 12 January 2017. ^ Seltzer, Brian (11 January 2017). "Game Recap: McConnell Beats Buzzer, Knicks". NBA.com. Retrieved 12 January 2017. ^ "Joel Embiid, Kawhi Leonard named NBA Players of the Week". NBA.com. 23 January 2017. Retrieved 23 January 2017. ^ "Minnesota's Towns and Philadelphia's Embiid headline roster for 2017 BBVA Compass Rising Stars Challenge". NBA.com. 25 January 2017. Retrieved 26 January 2017. ^ "Sixers Center Joel Embiid Named NBA'S Eastern Conference Rookie Of The Month". NBA.com. 2 February 2017. Retrieved 2 February 2017. ^ "JOEL EMBIID NAMED TO TACO BELL SKILLS CHALLENGE". csnphilly.com. 2 February 2017. Retrieved 13 February 2017. ^ Bodner, Derek (11 February 2017). "Joel Embiid has a torn meniscus in his left knee". DerekBodner.com. Retrieved 11 February 2017. ^ "Denver's Jokic and Oklahoma City's Abrines to replace Philadelphia's Embiid in 2017 NBA All-Star Events". NBA.com. 15 February 2017. Retrieved 17 February 2017. ^ "Joel Embiid 'Out Indefinitely' With Swellness In Knee". cbslocal.com. 27 February 2017. Retrieved 27 February 2017. ^ "Joel Embiid | Medical Update". NBA.com. 1 March 2017. Retrieved 1 March 2017. ^ "Joel Embiid Undergoes Successful Surgery". NBA.com. 24 March 2017. Retrieved 24 March 2017. ^ Rohrbach, Ben (26 June 2017). "Draymond Green, Joel Embiid headline NBA's All-Defensive, All-Rookie team announcements". Yahoo.com. Retrieved 27 June 2017. ^ "Joel Embiid Agrees To Five-Year Contract Extension". NBA.com. 10 October 2017. Retrieved 10 October 2017. ^ Wojnarowski, Adrian (10 October 2017). "Joel Embiid agrees to 5-year, $148M deal with Sixers". ESPN.com. Retrieved 10 October 2017. ^ "John Wall scores 28 points, Wizards hold on to beat 76ers". ESPN.com. 18 October 2017. Retrieved 18 October 2017. ^ "Ben Simmons has triple-double in fourth game, Joel Embiid adds 30 in 76ers' win". ESPN.com. 23 October 2017. Retrieved 23 October 2017. ^ "Simmons helps 76ers beat Rockets 115-107". ESPN.com. 30 October 2017. Retrieved 30 October 2017. ^ a b c "Embiid's career-high 46 leads 76ers past Lakers 115-109". ESPN.com. 15 November 2017. Retrieved 15 November 2017. ^ SportsCenter (15 November 2017). "Joel Embiid is the first NBA player with 40+..." Twitter. Retrieved 15 November 2017. ^ a b "Embiid scores 26, Sixers beat Celtics 89-90". ESPN.com. 18 January 2018. Retrieved 18 January 2018. ^ "Philadelphia 76ers Center Joel Embiid Named Eastern Conference Player of the Week". NBA.com. 22 January 2018. Retrieved 22 January 2018. ^ "Embiid has 29, Sixers use late run to beat Clippers, 112-98". ESPN.com. 10 February 2018. Retrieved 10 February 2018. ^ "Philadelphia 76ers Center Joel Embiid Named Eastern Conference Player of the Week". NBA.com. 12 February 2018. Retrieved 12 February 2018. ^ "Embiid, Simmons rally 76ers past Knicks, 118-110". ESPN.com. 15 March 2018. Retrieved 15 March 2018. ^ "Embiid leads 76ers past Nets". ESPN.com. 16 March 2018. Retrieved 16 March 2018. ^ "Joel Embiid Medical Update". NBA.com. 29 March 2018. Retrieved 29 March 2018. ^ Wojnarowski, Adrian (31 March 2018). "Joel Embiid has surgery to fix orbital bone fracture". ESPN.com. Retrieved 31 March 2018. ^ "Embiid scores 23, 76ers top Heat 128-108 for 2-1 series lead". ESPN.com. 19 April 2018. Retrieved 19 April 2018. ^ "Believe it! 76ers roll with Meek Mill past Heat in Game 5". ESPN.com. 24 April 2018. Retrieved 24 April 2018. ^ "Rozier (29 pts), Tatum (28) help Celtics beat 76ers 117-101". ESPN.com. 30 April 2018. Retrieved 30 April 2018. ^ "Celtics beat 76ers 114-112 in Game 5, advance to face Cavs". ESPN.com. 9 May 2018. Retrieved 9 May 2018. ^ a b "NBA admits Joel Embiid was fouled by Celtics in closing seconds of Game 5". PhillyVoice. 11 May 2018. Retrieved 11 May 2018. ^ Seltzer, Brian (24 October 2018). "At the Buzzer | Bucks Trio Proves Too Much". NBA.com. Retrieved 24 October 2018. ^ a b "Embiid leads 76ers past Hornets". ESPN.com. 27 October 2018. Retrieved 27 October 2018. ^ "Embiid leads 76ers past Clippers 122-113". ESPN.com. 1 November 2018. Retrieved 1 November 2018. ^ "Embiid scores 39 points in Philadelphia's win over Detroit". ESPN.com. 3 November 2018. Retrieved 3 November 2018. ^ Seltzer, Brian (3 November 2018). "Game Recap | Embiid's Latest Dominant First Half Yields Another Victory". NBA.com. Retrieved 4 November 2018. ^ "Joel Embiid has 42 points, 18 rebounds in 76ers' OT win". ESPN.com. 9 November 2018. Retrieved 10 November 2018. ^ "Magic come back to beat 76ers 111-106 in Butler's debut". ESPN.com. 14 November 2018. Retrieved 14 November 2018. ^ Seltzer, Brian (14 November 2018). "Game Recap | Butler Provides Encouraging Signs in Debut, but Team Falls in Orlando". NBA.com. Retrieved 15 November 2018. ^ "Pacers spoil Embiid's 40-point night, beat Sixers 113-101". ESPN.com. 14 December 2018. Retrieved 14 December 2018. ^ "Embiid scores 42 points, 76ers hold off Suns 132-127". ESPN.com. 2 January 2019. Retrieved 3 January 2019. ^ "Embiid drops 33 points, lifts 76ers past Pacers in return to action". ESPN.com. 10 March 2019. Retrieved 11 March 2019. ^ "Giannis pours in career-high 52 in loss to Sixers". ESPN.com. 17 March 2019. Retrieved 18 March 2019. ^ "Embiid gets 37 and 22 to lead 76ers past Celtics 118-115". ESPN.com. 20 March 2019. Retrieved 21 March 2019. ^ Pompey, Keith (20 March 2019). "A late basket by Jimmy Butler lifts the Sixers over the Celtics". Philly.com. Retrieved 21 March 2019. ^ "Embiid's big night leads 76ers past Nets 123-110". ESPN.com. 28 March 2019. Retrieved 29 March 2019. ^ "Bucks clinch top seed in the East with win over 76ers". ESPN.com. 4 April 2019. Retrieved 5 April 2019. ^ Rosen, Lauren (4 April 2019). "Embiid's 2nd Triple-Double Not Enough in Loss to Bucks". NBA.com. Retrieved 5 April 2019. ^ "76ers rest starters ahead of playoffs, beat Bulls 125-109". ESPN.com. 10 April 2019. Retrieved 11 April 2019. ^ "Meet Kansas' Joel Embiid, a Cameroon native turning into future NBA star". bleacherreport.com. 16 December 2013. Retrieved 7 February 2017. ^ "Joel Embiid named to Cameroon's preliminary roster for FIBA Afrobasket 2017". libertyballers.com. 7 February 2017. Retrieved 7 February 2017. ^ "Embiid, Mbah a Moute and Siakam headline cameroons for FIBA Afrobasket 2017". FIBA.com. 6 February 2017. Retrieved 7 February 2017. ^ "Cameroon". FIBA AfroBasket Senegal Tunisia. FIBA. Retrieved 28 December 2017. ^ "Embiid's double-double powers 76ers past Knicks 117-91". ESPN.com. 28 November 2018. Retrieved 28 November 2018. Thomas Embiid, a colonel in the Cameroon military who is visiting from the family's home country and plans to spend a few weeks with his MVP candidate son. ^ Associated Press (16 October 2014). "Joel Embiid's brother dies in Africa". ESPN. ESPN Internet Ventures. Retrieved 21 October 2014. ^ Haberstroh, Tom (10 March 2016). "TrueHoop Presents: The man charged with healing Joel Embiid". ESPN. Retrieved 14 March 2016. ^ "Joel Embiid - 2013-14 Men's Basketball". University of Kansas Athletics. Retrieved 29 October 2014. ^ King, Jason (17 December 2013). "Meet Kansas' Joel Embiid, a Cameroon Native Blossoming into a Top NBA Prospect". bleacherreport.com. Retrieved 8 July 2017. ^ staff (20 November 2017). "Joel Embiid takes troll game to next level in Philadelphia 76ers' win over Utah Jazz". NBA. Retrieved 12 December 2017. ^ "Of course Joel Embiid isn't worried about players going after him for his trolling". 22 November 2017. Retrieved 12 December 2017.